In another busy trade period for the Power, Port has crept up the draft order another spot while gaining a reclamation project, and shedding a couple of potentially handy picks on the way. 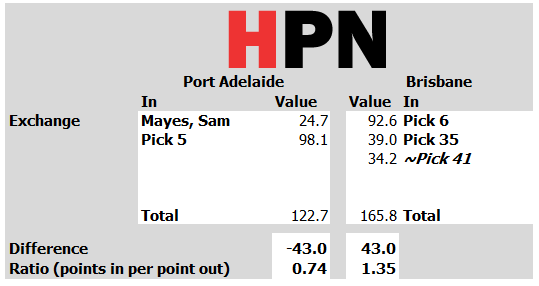 Port Adelaide have taken on a fringe player in Sam Mayes in order to further move up the draft order, and essentially pay a premium to remove Brisbane (or eventually Fremantle) from the list of clubs who might plausibly take whoever it is they’re targeting at the top end. 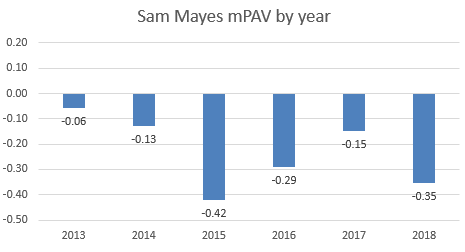 While he was a former number eight draft pick in 2012, there’s not a lot of promise left in Sam Mayes. He’s hitting the age where performing below replacement level in limited senior games in a weaker side starts to suggest a terminal career, and his projection reflects that. His best year was actually his first season at the Lions where in 18 games his marginal PAV output, a per-game measure of value, was around the league average player mark of -0.06. Since that first year he’s declined, and every year after 2014 has been below replacement level. The hope is that the new environment will have him vaguely capable of contributing like in his early days, but he should probably get used to prison-barred black and white stripes. 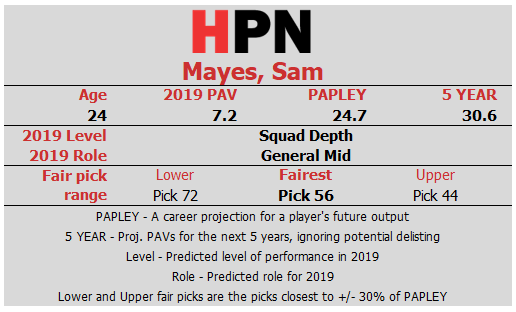 Mayes is the least valuable piece in “the Mayes trade” which was itself popularly reported as part of the much higher profile Wingard/Burton deal but is largely standalone except for the involvement of what was formerly Hawthorn’s pick 35. The main event here is Port Adelaide shedding draft currency to upgrade, after winning big in that Wingard deal, to achieve their stated objective of climbing the draft order. It is becoming increasingly clear that Port will not use many selections in the upcoming draft. In net terms they’re still ahead because of how big the draft gain was in the Wingard swap. Brisbane’s upside is obvious here. Verdict: Slightly unfair in favour of Brisbane.